Oregon State came into Wednesday evening’s match-up against the Indiana Hoosiers following an 11-4 rout of Louisville on Monday, driven with momentum to grab their third NCAA title in school history and first since winning back-to-back championships in 2006 and 2007. Wednesday’s game displayed that momentum, as the Beavers shut down the Hoosiers 1-0, ousting Indiana from the NCAA Tournament and advancing to the next round of the College World Series. 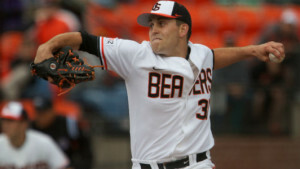 The Beavers were led by their staff ace Matt Boyd who pitched masterfully, pitching a complete-game shutout against a hot-hitting Indiana lineup and leading the charge for a Beavers team who is inching closer to title number three. In nine innings of work, Boyd surrendered just four hit and struck out an impressive 11 batters while walking three. Boyd needed 121 pitches to complete the gem, but was very efficient in his outing, painting the plate effectively and mixing his fastball and off-speed pitches well enough to baffle a talented Hoosiers lineup. While Boyd turned in a gem for the Beavers, Indiana’s Aaron Slegers did just that for the Hoosiers, but in a losing effort. Slegers went the distance, pitching nine innings of one run ball, surrendering seven hits and striking out five. Slegers did everything that the Hoosiers could have possibly asked of him, but the offense was unable to come through against a dominant Matt Boyd. The only run of the game came in the fourth inning on a Jake Rodriguez sacrifice fly to right field, which scored Kavin Keyes and gave the Beavers an early 1-0 lead. Neither team would muster a legitimate scoring threat for the rest of the game, as both starting pitchers kept both lineups in check with relative. With two outs in the bottom of the ninth, Sam Travis blooped a single into shallow right, giving the Hoosiers the tying run on first. However, Boyd would get Nick Ramos to groundout to third to end the game, cementing a 1-0 victory for the Beavers. The Beavers will face Mississippi State on Friday, but will need to secure two victories against the Bulldogs (a second game will be played on Saturday if the Beavers win on Friday) in order to move on to the best of three championship series.